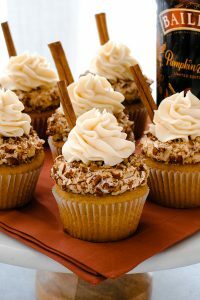 Baileys Pumpkin Spice Cupcakes – moist pumpkin cupcakes topped with silky smooth buttercream frosting spiked with a splash of Baileys Pumpkin Spice. I shared this recipe with our Instagram community last fall but never posted it here on the blog. I realize many of you follow along on Instagram and have already given this recipe a try! But this frosting is seriously too good to let our blog-only friends miss out! How can you go wrong with anything involving Baileys, right? I mean, dessert and adult beverage in one – that is the ultimate! 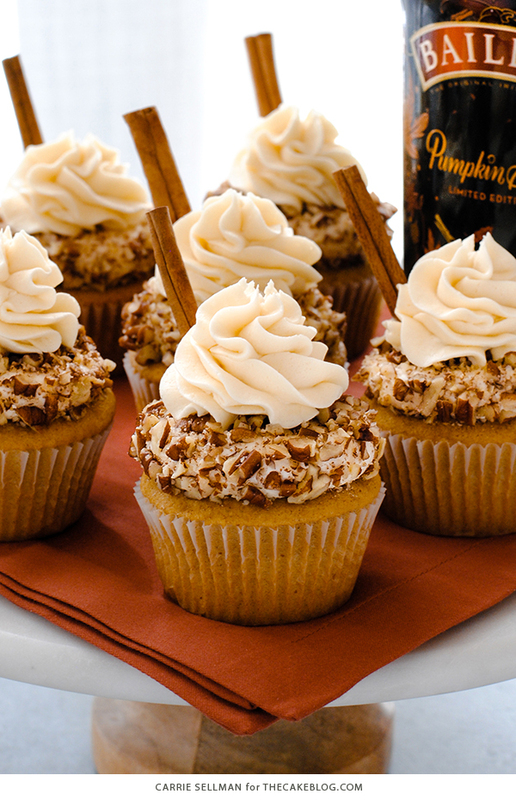 The base of this recipe is our classic pumpkin cupcake recipe from 2011. It is a tried and true staple that everyone loves, even non-pumpkin eaters. Then comes the silky smooth buttercream frosting. It’s a standard “American” style buttercream made with butter and confectioners’ sugar, which means it’s super easy to mix up! With a hefty splash of Baileys Pumpkin Spice, we add notes of pumpkin, cinannamon, vanilla and coffee. All of the fall loves! Piping a flat swirl of icing and then rolling it in chopped pecans creates a bottom tier of nutty frosting to hold a frilly top swirl. Add a cinnamon stick for dramatic flair, if that speaks to you. As you finish up, be sure to leave a little frosting behind in the bowl… that spoonful (errrr… lick) has your name on it! However you roll, I hope you give this one a try! In large bowl combine dry ingredients: flour, baking soda, baking powder, salt, cinnamon, ginger and nutmeg. In bowl of stand mixer, beat butter, granulated sugar and brown sugar until creamy. Add dry ingredients and milk, alternating until well combined. Scrape down sides of bowl as necessary. Using a stand mixer fitted with the paddle attachment, mix the butter, Bailey’s Pumpkin Spice and one cup of the confectioners’ sugar until smooth. Gradually add remaining confectioners’ sugar one cup at a time. Scrape down sides of bowl as needed. Mix on lowest speed for 5 minutes until silky smooth and creamy. 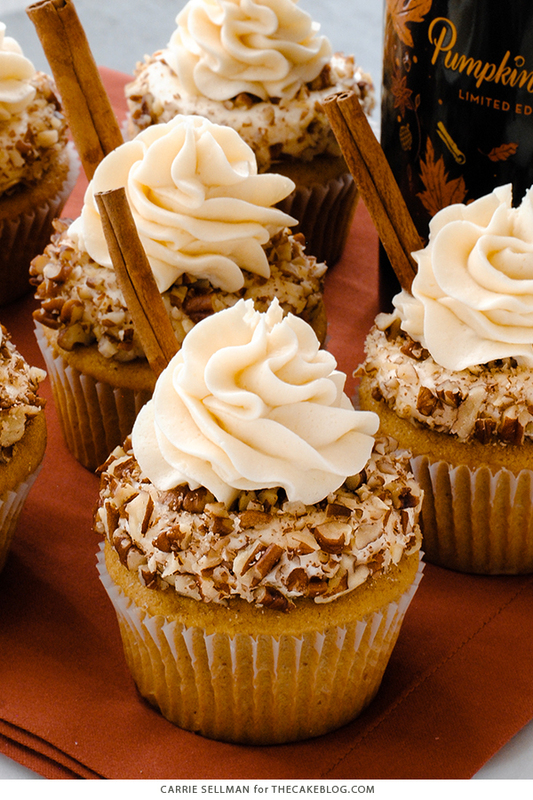 Use a large round tip to pipe a circle of frosting onto your favorite pumpkin cupcake. Use a large star tip to pipe a swirl of frosting to finish. Adorn with cinnamon sticks, if desired. 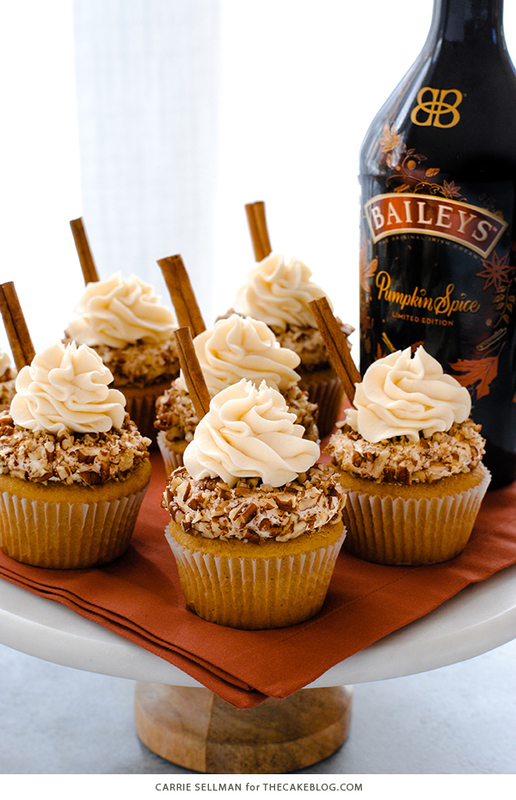 Pumpkin spice cupcakes + baileys? Oh, I already know I’m going to love this. Can’t wait to try it myself! Thank you Diana! Hope you love them! Have you ever baked this cake in layers rather than cupcakes?? Yes, you can bake this in two 8″ round pans for roughly 40-44 minutes. Or divide it into three 8″ round pans (for intentionally shorter layers that don’t need to be torted) and bake 30-32 minutes. Hope you enjoy! Waouh .. what a treat ! I’m dying to try your cupcakes, but before I do I was just wonder if there is a mistake in your recipe for the frosting. No mistake in the recipe – there’s one cup unsalted butter and one cup salted butter. The salted butter adds a nice contrasting balance to the sweetness of the sugar. But using all salted butter would make it noticeably salty. A half/half mixture is just right. Hope you enjoy! Hi there. Does anyone know what I can substitute for red wine in a cake? Red grape juice could be a decent substitute, if you want a non-alcoholic option. Adding a splash of vinegar to the grape juice would more closely replicate the acidity of the red wine in the original recipe. Our article about baking with alcohol might come in handy for you. You can find it HERE. So happy to hear that Sandy! And thanks for coming back to leave your feedback – I appreciate it so much!! Am I correct to assume that this is a crusting buttercream? Yes and no. It uses confectioners’ sugar like a standard crusting buttercream. But because the ratio of sugar to butter is somewhat lower than a standard crusting buttercream, it will remain somewhat softer with only a little crusting. With the addition of more sugar, you’d get more of an outside crust but it would also be a lot sweeter. these are literally baking right now so I hope I can get a response! The recipe says : Cinnamon Cream Cheese icing, but there is no cream cheese called for in the icing. Is this a misprint?? Please help!!! Thanks Pam. Correct, there is no cream cheese in this frosting. I’ve removed the reference, it was a misprint. But the actual ingredient list was/is correct. So your end result should be exactly as it should be! Hope you enjoyed! Hi! QQ: Can the recipe be halved in make only 15? Made these yesterday and they turned out perfect!!! Couldn’t find any Baileys Pumpkin Spice so I just used regular Baileys and added pumpkin spice seasoning to the icing. Awesome, thanks for the feedback Catherine! And good to know that your substitution worked well! I was so impressed on how fluffy and moist the cupcakes turned out. These were a hit with my family at Thanksgiving. When I shared these with my neighbor, she said that these look like they came straight out of a bakery. I’ve already made 3 batches of these cupcakes. They are so good! Thank you for this recipe! Hello! Which round tip did you use for the frosting? I love these!